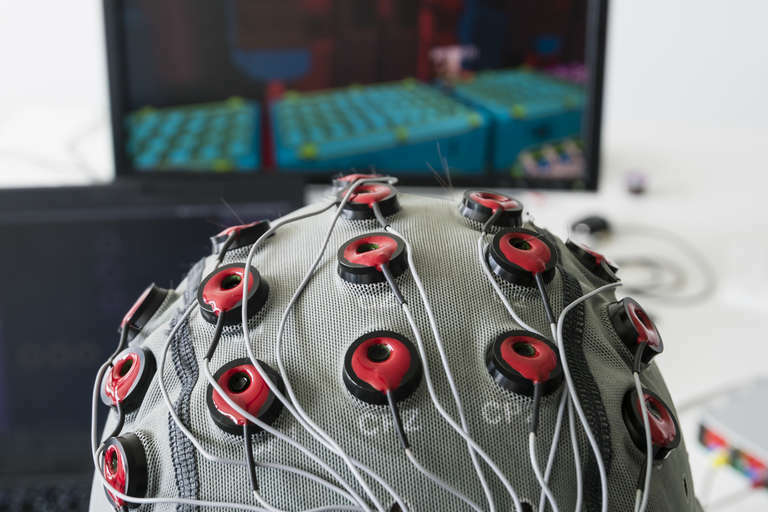 Researchers have unveiled a new technology called BrainNet that connects brains using EEG, transcranial stimulation, and direct brain interfaces. T	T	echnological telepathy is within reach. Back in 2013, computer scientists at the University of Washington reported on a delightfully weird breakthrough. Using a combination of electroencephalogram (EEG) technology and transcranial magnetic stimulation (TMS), the researchers had approximated a kind of telepathic connection between two human brains. This week the same team upped the ante by connecting three people in what is being billed as the world's first brain-to-brain interface for direct collaboration. Welcome to the future! Here's your skullcap. The new system, dubbed BrainNet, has two basic components. The first part of the interface, worn by the Sender, uses EEG patches on the skull to record brain signals. The second unit, worn by the Receiver, uses TMS patches to deliver information through the skull and into the brain. Everything is on the outside, taped to the head — no surgery required. When the two components are connected by a standard wireless signal, or via the Internet, the Sender can send “thoughts” to the Receiver. Well, kind of. To demonstrate the BrainNet system, two of the three subjects acted as Senders while they were watching a Tetris-like game of rotating blocks. 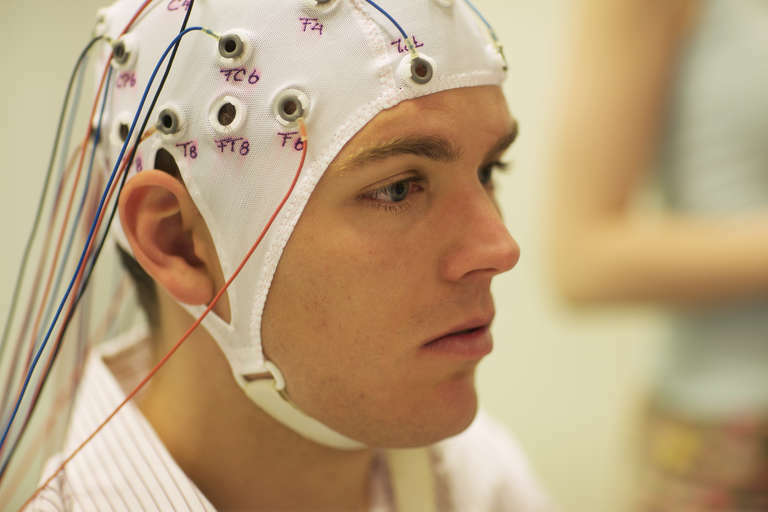 The EEG system extracted their decisions about whether or not to rotate a certain block. The trick is that the Senders couldn't control the game. The joystick was actually in the hands of a Receiver who couldn’t see the screen. As the Senders stared at the LEDs, their brainwaves were beamed out to the headset worn by the Receiver. The transcranial stimulator unit used precise magnetic pulses to stimulate the brain's occipital cortex and generate phantom flashes of light in the Receiver's brain. The Receiver couldn’t see the game, but by concentrating on the input signals from the Senders, the Receiver could determine whether or not to rotate the block. Essentially, the Senders beamed their thoughts directly into the brain of the Receiver, using none of the standard communication modes we humans have gotten used to over millennia — no gestures, no sounds, no language. Though the system is slow and not 100% consistent, it facilitates direct brain-to-brain communication — or telepathy, if you're feeling dramatic. The research team’s work still needs to be peer-reviewed, but a paper about BrainNet that was published on the preprint online repository arXiv notes that it could pave the way toward neural social networks. “Our results raise the possibility of future brain-to-brain interfaces that enable cooperative problem solving by humans using a 'social network' of connected brains,” the authors write. But none of the technology involved in this is particularly new, actually. The pulsing LED trick has been in use for more than a decade as a way to design eye-tracking software and, more recently, to allow disabled persons to approximate telepathic typing. And depending on how you define your terms, electrical brain stimulation has been around in one form or another since the early 1800s. Remember electroconvulsive therapy? That was a raw take on the theme. The BrainNet system builds on the existing technologies by introducing some next-level dynamics concerning group collaboration theory and performance testing. During subsequent rounds of the game, Senders can validate and provide feedback to the Receiver, after they see whether their collaborative partner rotated the Tetris block properly. Sussing out a Sender’s reliability would only grow more complicated as the network includes a higher number of connected brains. But the promise of this new mode of communication could have a range of different applications, from everyday collaborative projects to medicine, enabling people to combine their mental efforts to work together and solve problems. It could also make the internet even weirder than it already is.